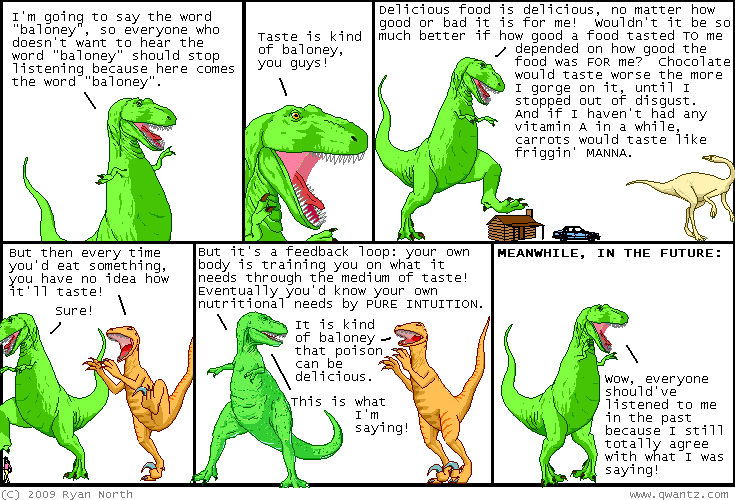 Dinosaur Comics - April 16th, 2009 - awesome fun times! April 16th, 2009: Everyone seems really into my new shirt / print, which is amazing! It's so awesome to see it linked to in all these crazy places. Titans of Small Town was a lot of fun! I sold my paintings to two great people which was really flattering, and I ate Brooklyn pizza with Chris Hastings, Carly Monardo, Emily Horne, Joey Comeau and a wanted felon, which, you know, is one more checkmark on that lifetime to-do list. A new MS Paint Adventures story? YES PLEASE..
One year ago today: if any of my readers explode today due to a loss of atomic cohesion, i'll be all, wow, did i call that or what?